AUSTRALIA exported 835,205 tonnes of wheat in February, down 3 per cent from 857,494t shipped in January, according to the latest data from the Australian Bureau of Statistics, with The Philippines its biggest bulk customer. In bulk exports, The Philippines with 152,582t, Korea with 150,150t and Japan with 110,772t were the biggest-volume customers, with The Philippines gaining special mention in this week’s USDA reporting (see below). In boxed sales, Myanmar on 22,503t, Malaysia with 17,928t and Thailand with 14,069t bought the largest tonnages. Market Check head of strategy Nick Crundall said February’s wheat exports were relatively strong considering the size of Australia’s 2018-19 export surplus. “Unsurprisingly, Western Australia did the large majority of these exports, doing 770,000t for February, which exceeded the five-year average for the month,” Mr Crundall said. “This is encouraging to see, especially as we’re in the midst of our key exporting window. “Looking at the breakdown of destination, it’s unsurprising to see The Philippines take out number one place as our major export home for February, while Indonesia has continued to wind back on Aussie wheat procurement. 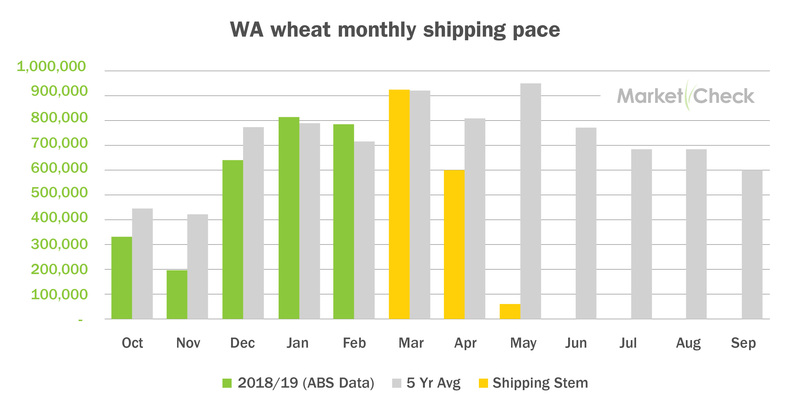 “Cheaper options from other origins like the Black Sea and Argentina, plus a lower-quality profile of the WA wheat crop, has meant we’ve seen a stronger presence of lower quality buyers feature in the data than in previous years. The USDA Grain: World Markets and Trade report released overnight pointed to The Philippines’ wheat imports surging to a record 7 million tonnes (Mt) in 2018-19. The report said The Philippines’ wheat imports have been rising in recent years, as demand for food and feed grains increases with the growing population. “Although primarily a rice-based diet, Philippine preferences are shifting from corn-based products to incorporating more affordable wheat products,” the report said. “Also, animal feeding is expected higher as demand for more protein in the diets continues to grow. “This year specifically, the trend towards stronger wheat use has intensified due to typhoon-related losses in the domestic corn crop. Table 1: ABS bulk Australian wheat export data for December and January 2018 and February 2019. Table 2: ABS boxed Australian wheat export data for December and January 2018 and February 2019.